The Tripoli is a modern and stylish Wicker Outdoor Lounge Set. With its generous volumes, comfortable seats and two coffee tables with tempered glass top, the Tripoli offers a magnificent setting to enjoy privileged moments with friends and family in a “lounge” ambience. Looking for a Protective Cover for your TRIPOLI Outdoor Lounge? The Tripoli Outdoor Lounge Set is part of our range of large outdoor lounges. 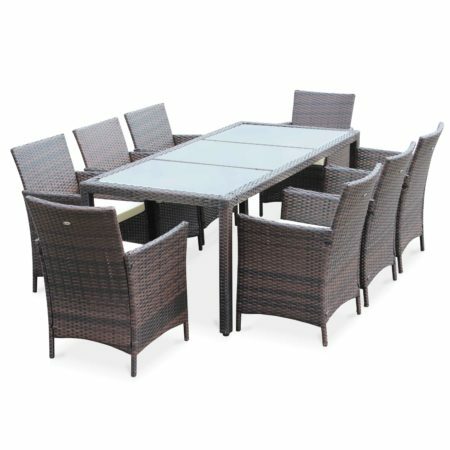 This set is adaptable to a range of terraces and is the largest outdoor lounge set on offer at Alice’s Garden – it can comfortably accommodate up to 13 people! Like many of our products, the use of wicker means that your brand new 13 seater outdoor lounge set will remain modern with a touch of class. Wicker is similar to natural rattan and gives the Tripoli set an elegant and designer look. For this reason, you can set up this sofa set either inside or outside. It’s safe to say that the Tripoli is one of our best sellers, and it’s not secret why. The Tripoli offers the utmost comfort with its 12cm thick armrests and backrests. Its padded cushions allow the user to experience the utmost support, making this lounge as comfortable as an indoor sofa. 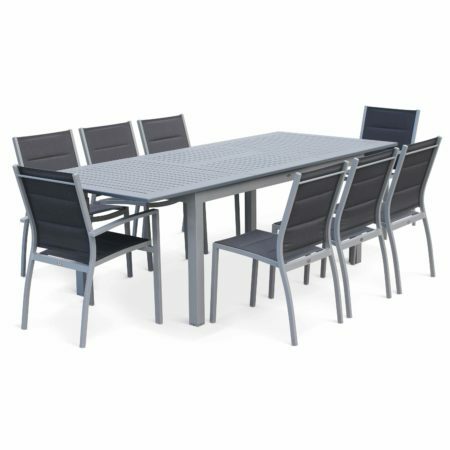 With excellent quality guaranteed, we’re extremely proud to offer an outdoor lounge set of this size with such great value for money. Alice’s Garden has carefully selected the best-quality materials to weave its furniture. This is one of the reasons why the Tripoli 13 seater is extremely durable! Alice’s Garden rattan can withstand a variety of conditions from the harsh sun’s rays to the relentless rain. The cushions also come with removable covers and are designed to be water resistant. To guarantee the Tripoli’s sturdiness, the frame is made from a reinforced aluminium so that by nature – it doesn’t rust and is lighter than a traditional steel frame. To re-inforce the sturdiness, the top of the coffee table deliberately utilises 5mm-thick toughened glass which is about 5 times stronger than traditional glass! And, if you’re looking to keep your Tripoli as pristine as the day you bought it, you’ll love our lounge cover designed specifically for the Tripoli which you can check out here! Lastly, The Tripoli uses a pack of 14 connectors so that you can attach the various modules together with absolute ease. Not only is the Tripoli an excellent addition to any outdoor area, it is also a magnificent compliment to many of our other products. Take our Vasto dining sets for example, not only do they come in a variety of sizes but like the Tripoli, they also utilise a beautiful wicker. This makes the Vasto 8, 10 or 12 seater an excellent match for your brand new Tripoli Outdoor Lounge Set. The Vasto dining sets are also designed to resist the elements and come in the same brown and grey colours that are available in the Tripoli. These two go together fantastically! PLEASE NOTE: The colour of the product on the photo may vary depending on your screen’s settings.